The ASUR (Airborne SUbmillimeter Radiometer [von König et al., 2000, Küllmann et al., 1999]) is an airborne radiometer measuring the thermal emission of trace gases in the stratosphere (in an altitude range between 15 and 50 km). The instrument detects the radiation in a frequency range between 604.3 and 662.3 GHz. This corresponds to wavelengths of about 0.45-0.5 mm. In this frequency range a major part of the radiation is absorbed by atmospheric water vapor. As most of the water vapor is found in the troposphere (in the Arctic up to 8 km, in the tropics up to 16 km altitude) the instrument is operated on board of an aircraft flying at an altitude of 10-12 km, such that a major part of the water vapor absorption is avoided. The ASUR instrument in its current configuration can measure emission lines of the trace gases HCl, ozone, ClO, N2O, HNO3, CH3Cl, H2O, BrO, HO2, HCN, and NO. The horizontal resolution of the measurements ranges between 12 and 50 km and depends on signal intensity and aircraft speed. The maximum time of continuous operation is 10-11 hours and is determined by the storage volume of liquid cryogen (see section Setup). The hardware of the ASUR instrument [Whyborn et al., 1996, Mees et al., 1995] has been developed and built in a collaboration between SRON (Space Research Organisation of the Netherlands), Groningen and the Institute of Environmental Physics of the University of Bremen. The spectrometers AOS (Acousto-Optical Spectrometer) and CTS (Chirp-Transform Spectrometer) were developed , in the framework of an ESA/ESTEC project by the Observatoire de Meudon, Paris, and the Deutsche Aerospace (now: ASTRIUM), respectively. 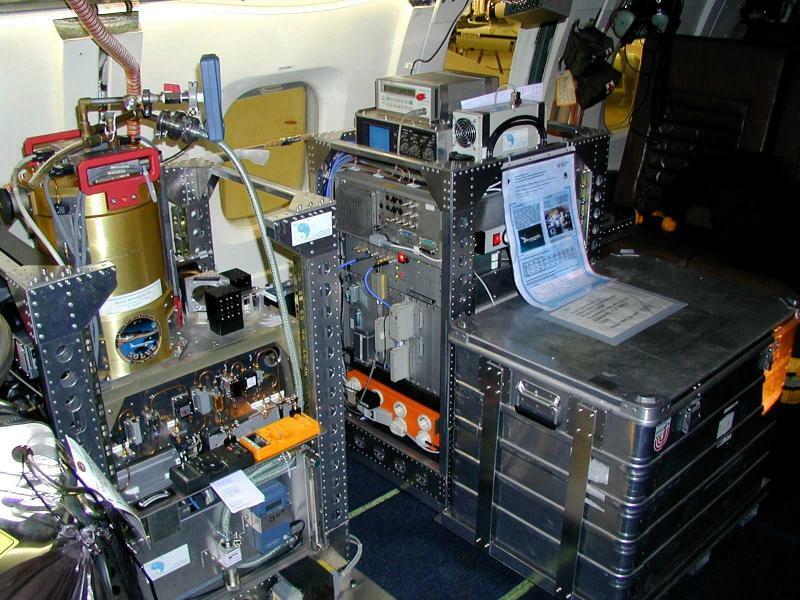 The photograph shows the ASUR instrument integrated in the NASA research aircraft DC-8. The instrument consists of two racks. In the left rack (front end rack) contains the cryostat (golden cylinder), the optics, and electronic control. The spectrometers as well as the computer, which is used for control and data storage, are located in the right rack (back end rack). In the background one can see the seat of the scientist who operates the instrument in flight. The setup of the ASUR instrument is schematically drawn in the following block diagram. The atmospheric signals reach the interior of the aircraft and ASUR's rotatable mirror through a special window (made of polyethylene). The rotatable mirror reflects the atmospheric signals and also two calibration signals into the ASUR instrument. In the normal measurement mode the mirror switches continuously between the atmospheric signals and the calibration signals. Further the mirror control enables to adjust the mirror to correct for the rolling of the aircraft (turning around the longitudinal axis), such that all atmospheric measurements are taken with the same elevation angle. Behind the mirror the signals reach a quasi-optical setup. Here unwanted frequencys and standing waves are filtered out or suppressed. Further an additional signal (local oscillator signal or LO-signal) with a defined frequency is heterodyned with the original signal. 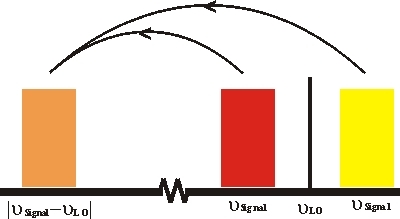 At the output of the quasi-optical setup the signal is received by a detector. In this detector a differential signal of the original signal and the LO-signal is generated (see following sketch). This process is termed as mixing and results in a transformation of the original signal to a lower frequency without losing the spectral information. The detector is a superconducting diode that is located in a dewar filled with liquid helium and liquid nitrogen. The liquid helium has a temperature of about 4 K (about -269° C), only at these temperatures the superconduction is possible. The liquid nitrogen (about 77 Kelvin, -196° C) is needed as a heat buffer between the liquid helium temperature and the ambient temperature. For this reason there are also evacuated volumes between the different tanks in the dewar. The superconducting diode enables the detection of very weak signals as well as a reduction in acquisition time for strong signal, which in turn leads to higher temporal resolution of the measurements. At the output of the diode, that is after the first mixing process, the signals have a frequency of 11,4 GHz (+/-2,25 GHz). In two following mixing steps they are transformed to the input frequencies of the two spectrometers: AOS at 2,3 GHz (+/-0,75 GHz) and CTS at 1,35 GHz (+/-0,09 GHz). On their way from the turning mirror to the the signals have experienced an amplification of about 80 dB (a factor of 108 = 100.000.000). Inside the spectrometers the signals are analyzed and digitized, such that the spectral information can be read out by a computer. Thus the measurements yield spectra of the different trace gases. Their further analysis is described in the section retrieval method. von König, M., et al., An Airborne Submm Radiometer for the Observation of Stratospheric Trace Gases, Microw. Radiomet. Remote Sens. Earth's Surf. Atmosphere, pp. 409-415, VSP, Utrecht, 2000. Küllmann, H., et al., The ASUR Sensor: A state-of the art remote sensing instrument for stratospheric trace gas measurements, Air pollution research report 73, Proceedings Fifth European Symposium on Stratospheric Ozone, St. Jean de Luz, France, 27.9.-1.10.1999, pp. 699-702. Whyborn, N.D., et al., An Airborne SIS Receiver for Atmospheric Research, Proc. 30th ESLAB Symp., 'Submillimetre and Far-Infrared Space Instruments', ESTEC, Noordwijk, The Netherlands, 24-26 September 1996, ESA SP-388, December 1996. Mees, J., et al., ASUR - An Airborne SIS-Receiver for Atmospheric Measurements at 625 to 720 GHz, IEEE Trans. Microwave Theory Tech., Vol. 43, No. 11, pp. 2543-48, November 1995.